November | 2011 | Hand Luggage. Highly excited, just added two new photo slide shows thanks to TripWow, one of India and one of Thailand. Check them out why don’t you . 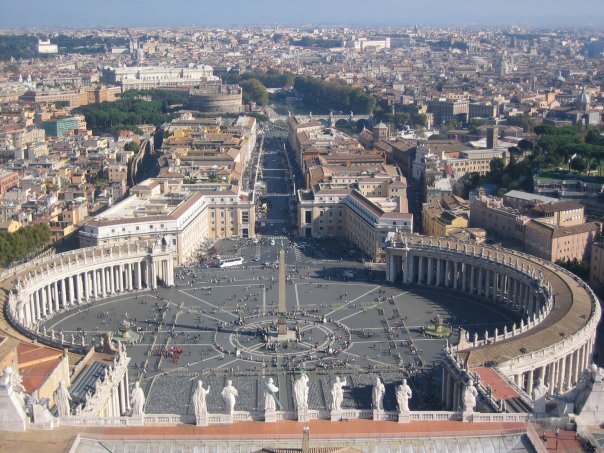 . .
First up St Peter’s Square and Basilica. 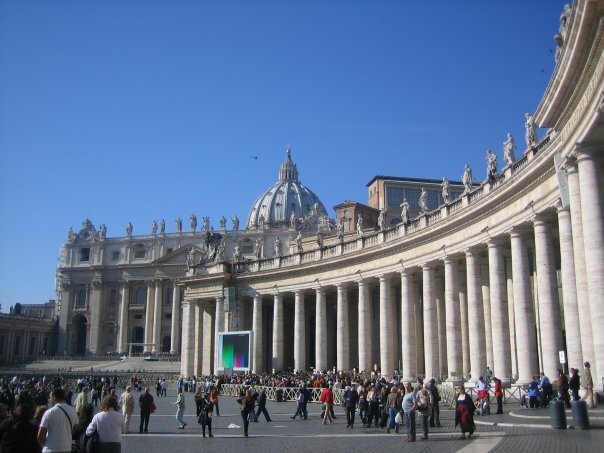 St Peter’s is a late Renaissance church with the largest interior of any Christian church in the world. Here’s the square. The giant TV screens, as we later discovered, were for broadcasting the Pope to the crowds as he made an appearance! As a result I have been accidentally blessed by the Pope. Cool. The dome of St. Peter’s rises to a total height of 136.57 metres (448.1 ft) from the floor of the basilica to the top of the external cross. It is the tallest dome in the world and by god did I feel it after climbing to the top. Here’s the iconic view from the top looking out over the square. 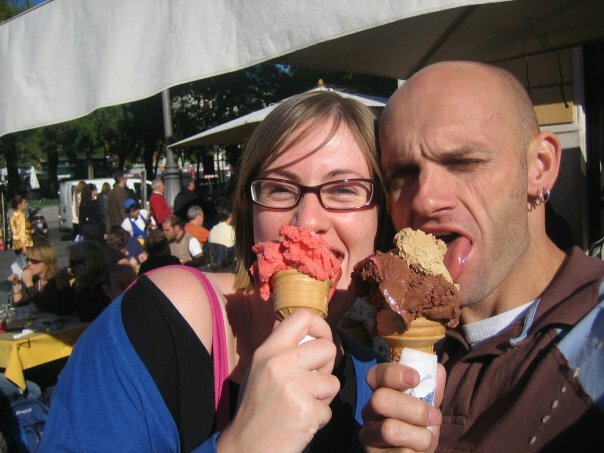 After nearly going blind climbing the hundreds of steps to the top I deserved ice cream, and the Italians do it rather well with Gelatto, a creamy creamy dollop of loveliness, here we are being typically restrained . 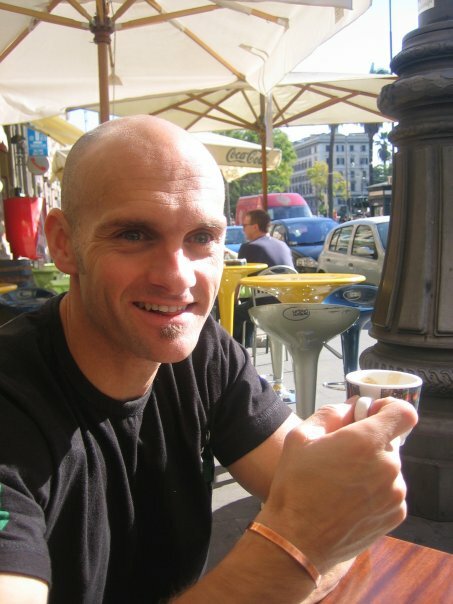 . .
And here is Mr Caffine Addict himself with one of the million coffees of the holiday. Vatican Museum, Gallery of Maps and the Sistine Chapel next up folks!!! 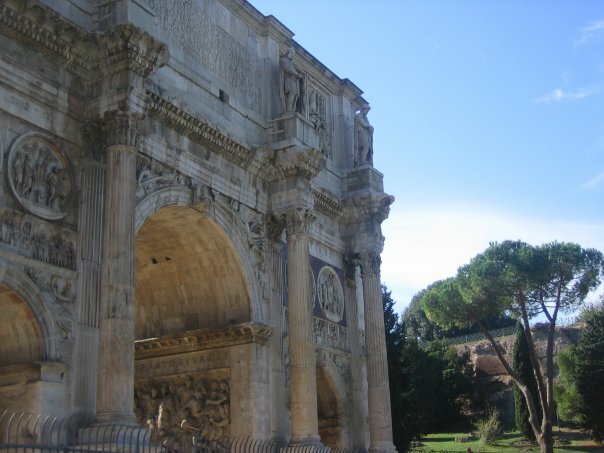 Our first ever trip to Italy was way back in 2007 when we headed to the Eternal City – Rome. Catching the bus to the city from the airport I did wonder what we were going to, so much graffiti covering shop blinds and walls, it seemed more like a ghetto than a historic, beautiful city. 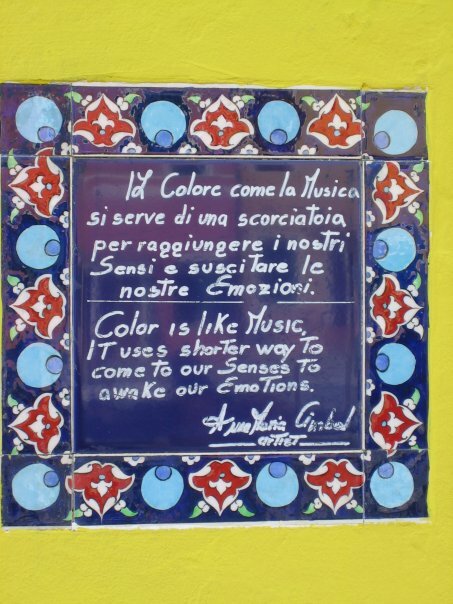 It was a theme that would reoccur every time we visited Italy, spraypainted scrawl across shops, businesses, railway sidings and disused factories. 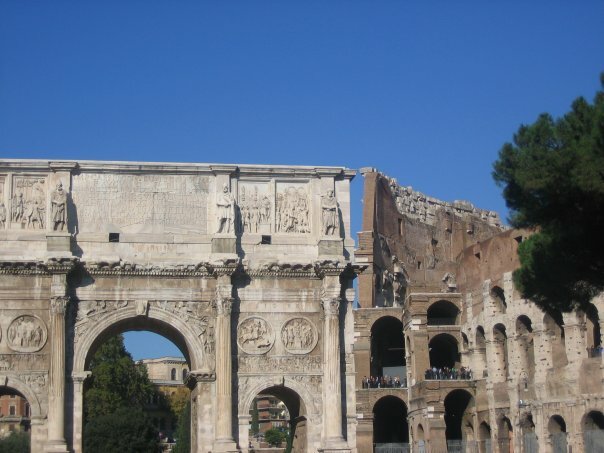 Strange that so much wanton vandalism sits cheek by jowl with such wonderful ancient architecture and history. 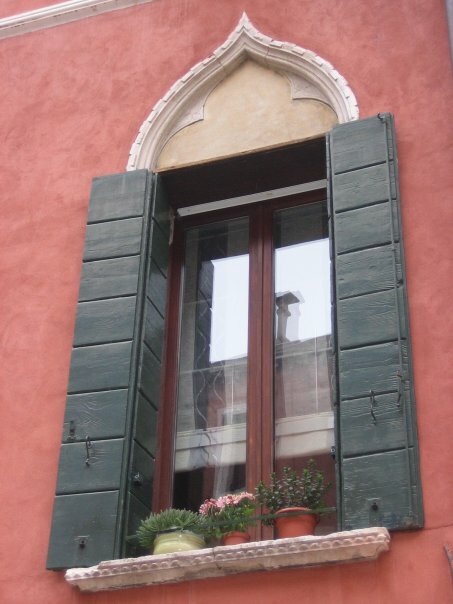 We stayed at the Antica Locanda, a cute little B and B just around the corner from the Colosseum. Our room had a gorgeous tiled and vaulted ceiling and antique furniture. 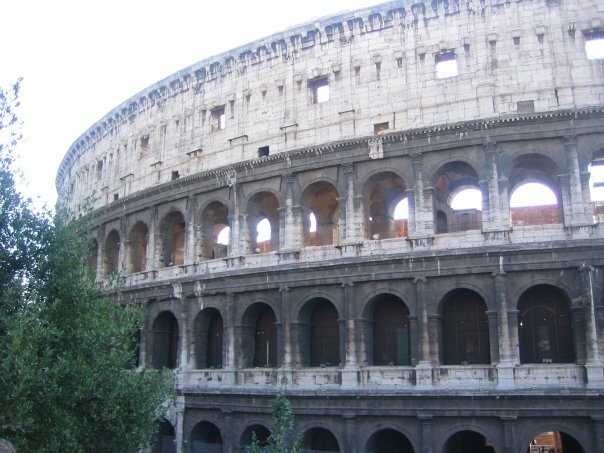 First stop, obviously the Colosseum, originally the Flavian Amphitheatre – it’s the largest ever built in the Roman Empire. 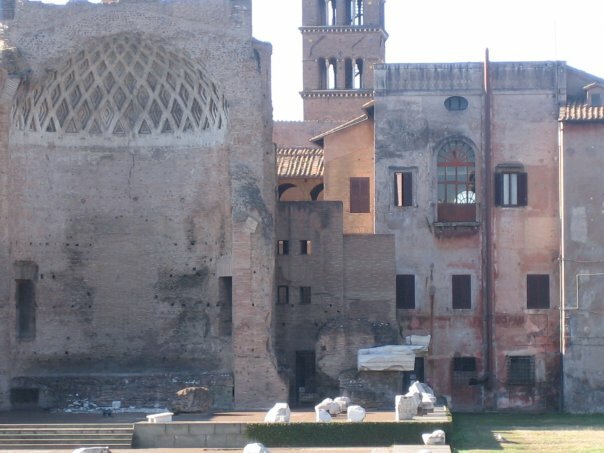 Close by is the Roman Forum – a rectangular plaza surrounded by the ruins of important ancient government buildings at the centre of the city. 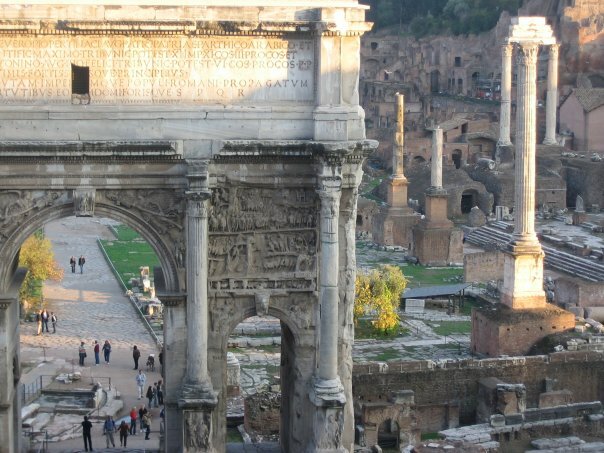 It was the centre of Roman public life: the site of triumphal processions and elections, venue for public speeches, criminal trials, and gladiator matches, and nucleus of commercial affairs. 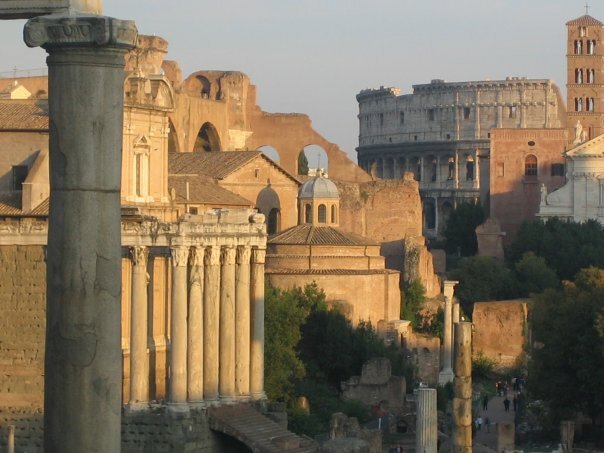 Here it is in all its glory as the sun starts to set over the ruins of the stately buildings. That’s enough history for now. Next up the Vatican Museum and the beautiful Sistine Chapel. As a matter of course we only ever take hand luggage on trips of seven days or less, and in the recent Italy / strike / delay debacle, our hand luggage actually managed to last us ten whole days (although it got stinky)! Having to pay extra cash to wait in line to check in a hugely overpacked suitcase, only to wait at the other end again in a tense panicky desperation about if it will ever turn up again, is not one of our favourite things. We love to breeze past the baggage reclaimation queues with a cheeky backward glance and a saucy shrug . So we say HELL NO! 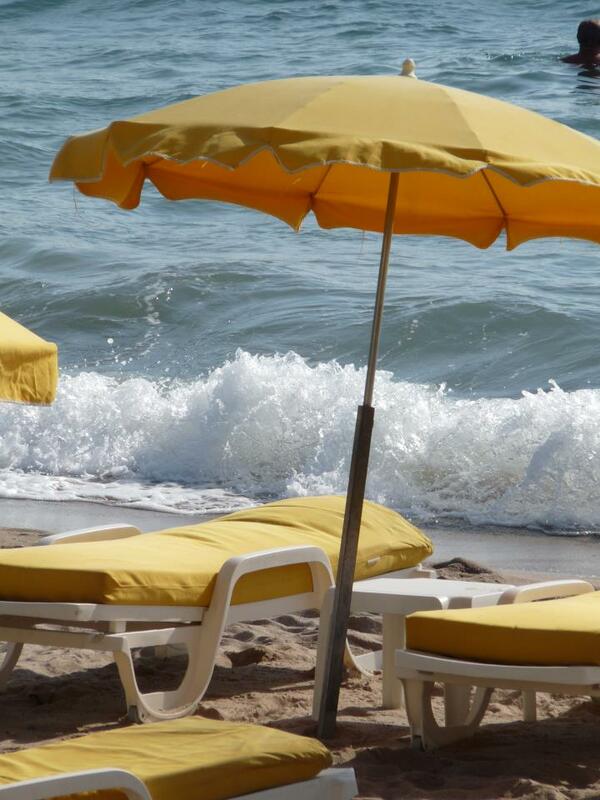 to checked in bags unless utterly unavoidable for long haul trips and even then it’s not always necessary. My luggage usually ends up busted open in transit or on route anyway – never underestimate the shame of the unfortunate sight of your not so smalls rotating on the baggage carousel or flying free from a bag as you leg it to catch a bus. 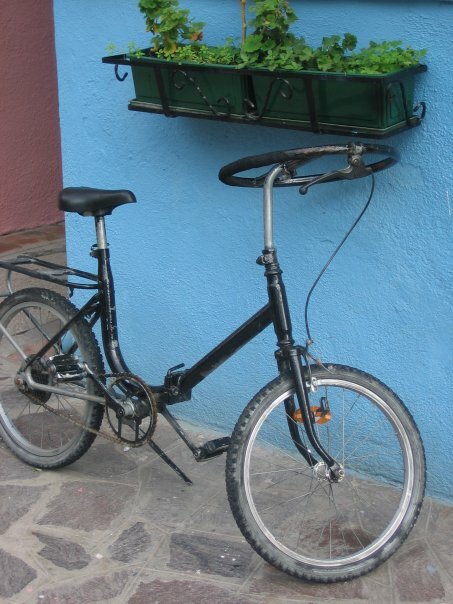 So how to pack light but still have enough clobber to see you through whatever the trip might throw at you? Including bird poo, curry spillages and any other projectile substances you may encounter. Some travellers suggest sticking to a colour theme, eg khaki, black and cream, so you can co-ordinate all your stuff easily. Yeap, good idea, I have no further comment on that one. Roll things into sausage shapes instead of folding them, takes up less room apparently and no boring creases. Only pack 2 pairs of shoes (yeap I wanted to vomit too) trainers and black flip flops. Covers all eventualities. You may look like an unstylish prat though. Make the most of the pathetically tiny bottles of liquid you can take. I use one for shampoo and conditioner in one, another for shower gel. I then steal the other half’s allowance too for body lotion, he only needs one. Then I use that one for anti bug spray. I usually chance it taking a disposable razor or two as well. If they confiscate them then so be it, I always seem to get them through though. Possibly don’t risk taking a cut throat though. 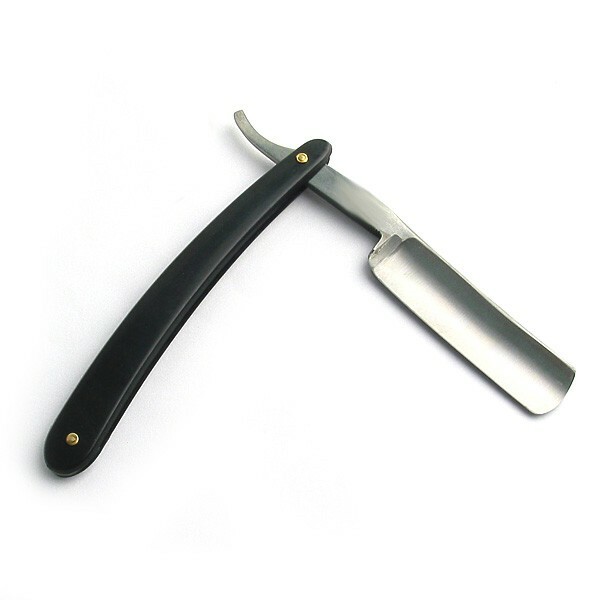 Probably can’t be passed off as a personal grooming implement. LAYERING – try and cram as much clothing on as possible, layer up with t shirts, thin jumper, thicker cardigan and then coat. Add a hat and scarf for extra effect. 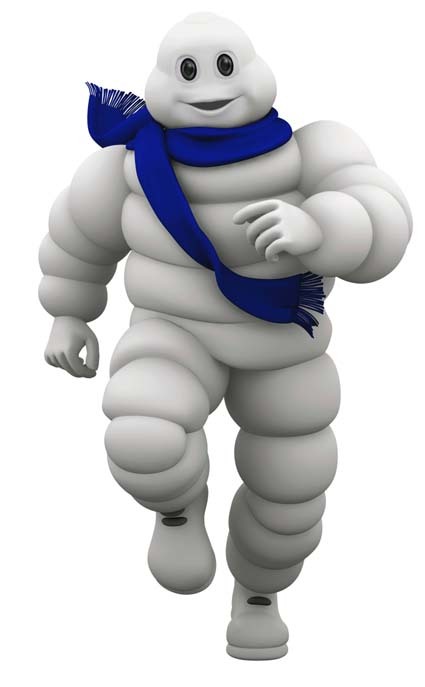 Sure you’ll look like the michelin man, cause utter chaos at the security check point where you will have to take it all off again and you’ll sweat like a man beast, but at least you’ve got an extra two day’s worth of outfits on! Airport security never saw me coming . . .
BLING IT UP – along similar lines, wear as many necklaces and bracelets as possible, so you rattle while you walk. Now you’ll have lots of pretty shiny things to dress up your basic, creased little wardrobe. Again, may cause problems when passing through the metal detectors and may end in a strip search, but hey, small price to pay!! STEAL FOOD – if you spend time in the executive lounge before flying as we sometimes do, take advantage of the adorably tiny packages of food that they have in abundance. Sure there are signs saying do not take food out of lounge but hey… You can stick loads of peanuts and shortbread into the numerous small and otherwise pointless pockets on rucksacks. Also good for appropriating are the little cheese portions and cream crackers. Put them in your jean pockets and try not to walk funny as you leave. The staff may hear your contraband crunching and crackling though – just stare them out and maintain a dignified and haughty manner as you exit. 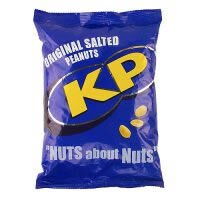 Actual size of peanut packets in VIP airport lounges – see you can hide millions of them on your person . . . I take absolutely no responsibility if you follow any of my tried and tested tips. Happy travels!! 3) Having a “hit list” of things to see instead of discovering the off the beaten track, not in the guide book, only find it if you live with a local for 6 months, knit your own jumper from a Peruvian yak and walk barefoot for 20 miles, sort of trip highlight. 1) Guide books do what they say on the tin – they GUIDE you, there is no shame in deferring to the experts and making the very most of your time and money when visiting a country that you have never seen before. If, once you have visited the highlights, you then want to go AWOL and find out more then you can, but, if you have seen / ticked off the big hitters you won’t then have to experience the ultimate frustration of returning home without seeing half of the things that made your country seem like such a great choice in the first instance. 2) Food – AKA the “authentic” fodder versus the places guide books tell you are nice (horror of horrors). 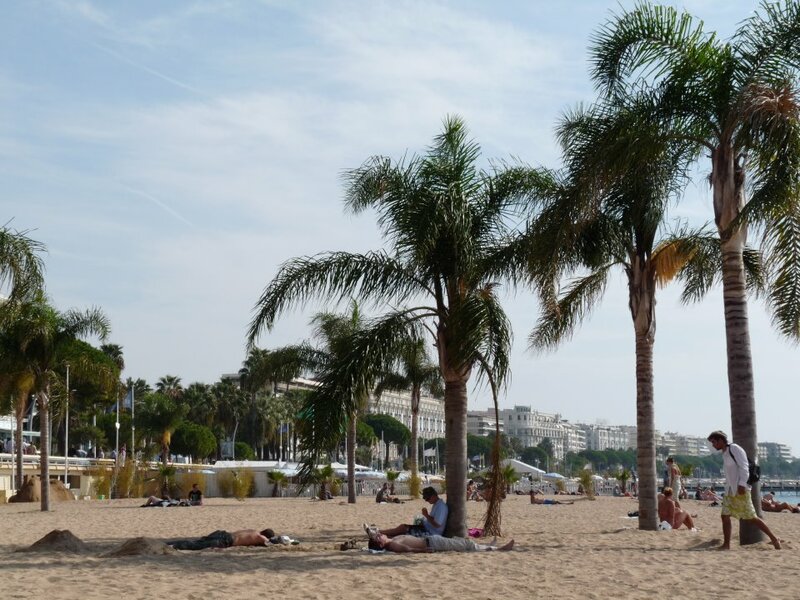 Right then – it’s ok to take a week or two out of a year long, parentally funded world trip with debilitating stomach cramps and projectile poo in order to experience the “authentic” street cuisine of the host country. Not such a smart move if, like me, you are one of the many millions of normal folk who can only have two or, if really lucky, three weeks holiday off at a time from our jobs and do not really have the time, inclination or most importantly money, to waste a third of the said holiday seeing nothing but the inside of your hotel toilet. 3) Getting off the beaten track for undiscovered sights and sounds. Or you might find something so amazingly mind blowingly great that you then want to tell everyone else and get it on the tourist map, but then horror of horrors, other people might see it, it’s not off the beaten track and here come the tourons . .! Ooooooh catch 22!!! I am totally a tourist, I admit it, I’m not a traveller (whatever that entails) I enjoy my hotel rooms with running water (preferably hot and cold) as few cockroaches / local bugs as possible and clean sheets. I am past the backpacking stage, the sharing a dorm with dreadlocked students who really need to reacquaint themselves with soap, people who find words like “employment”, “recessions” and “mortgage” boring and irrelevant to them. In short people who think real life is just for boring old losers, not them. I don’t see any one way of travelling as better than another, in my view however you experience a country is valid. You are still experiencing it. Whether that is for two years or two weeks, whether it is a coach trip or a camper van, whether it is a guided tour or off the beaten track. The fact that you have got off your backside and seen something different means that your world view is changed forever. And ultimately that, for me, is the most important thing. 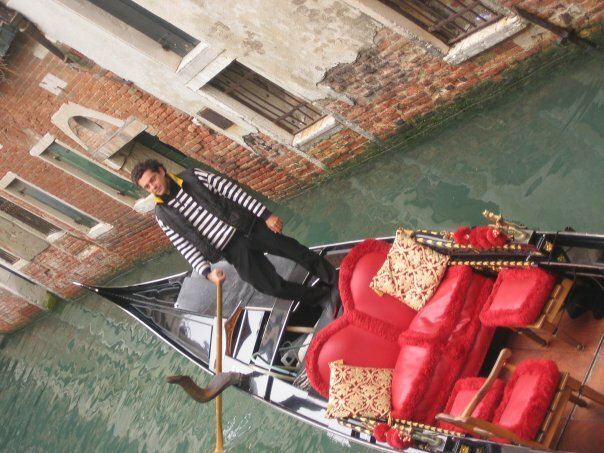 When ever you think of Venice there is always one thing that is bound to be mentioned – Gondolas, those romantic, sterotypical visions of Venice that ply their trade on the canals. Of course, as they cost astromomical amounts of money, we didn’t go on one. . . . so here’s some photos instead, as near as I got to one! He’s got his stripy top on. but where is his little hat and cornetto?? He is looking quite relaxed but that’s because just out of shot the entire canal is gridlocked and he is at the back of the traffic jam! 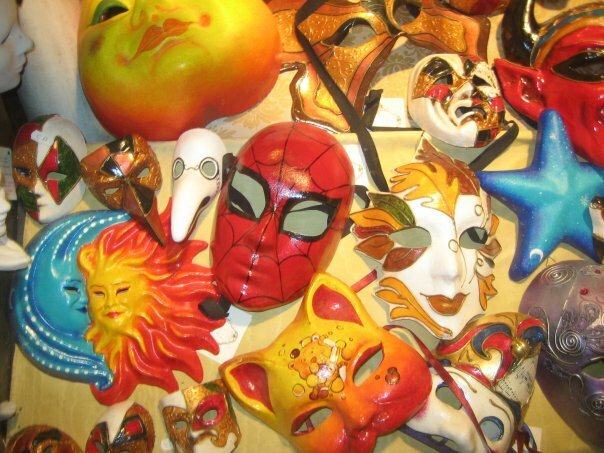 As well as gondolas, Venice is also famous for its incredible masks, and every other shop has window displays full of incredible flights of fancy in every shape and colour conceivable. 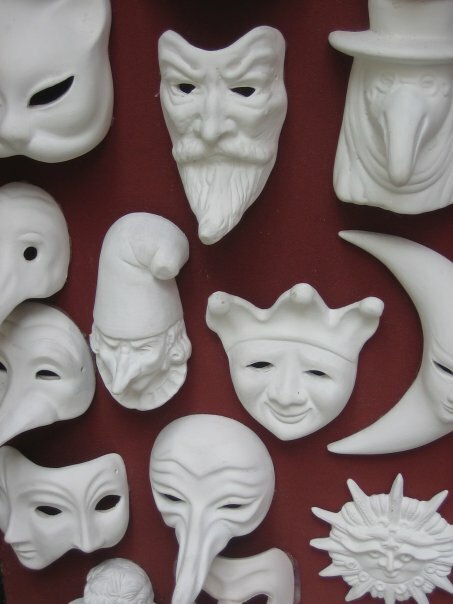 From the sinister to the silly, the fanciful to the freaky, there’s bound to be a mask that appeals to everyone. I took home a couple of the plain, unpainted versions with eerie long noses, similar to those worn by the plague doctors during the Black Death. Here’s just a couple of pictures of masks. After taking part in some retail therapy we hopped on a vaperetto and cruised off to a couple of the smaller islands alongside Venice, first up Murano, the island famed for its glass production. 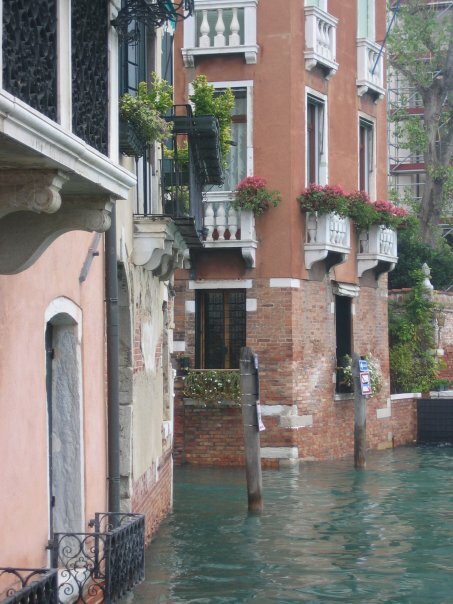 Murano is a series of islands linked by bridges in the Venetian Lagoon. 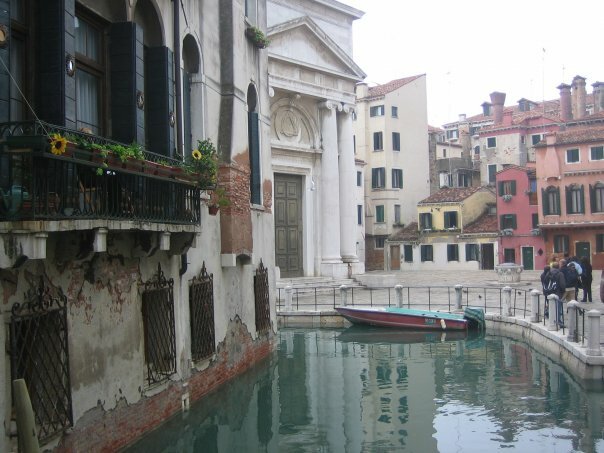 In 1291, all the glassmakers in Venice were forced to move to Murano due to the risk of fires. In the following century, exports began, and the island became famous, initially for glass beads and mirrors. For a while Murano was the main producer of glass in Europe. 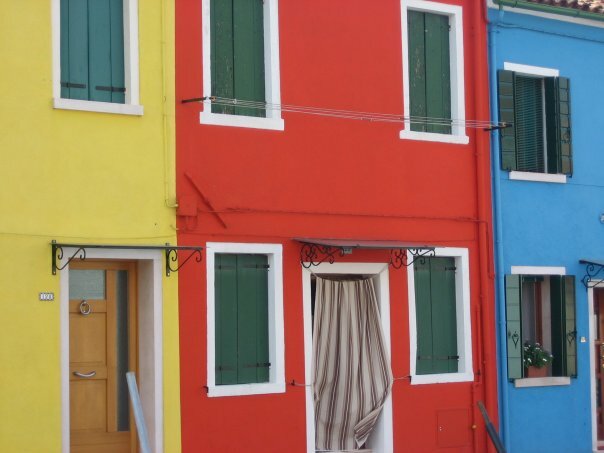 After a potter around the island we moved onto Burano, a colouful little island where one of the main industrys was lace making but the island is most famous for its vivid houses that are painted every colour of the rainbow. 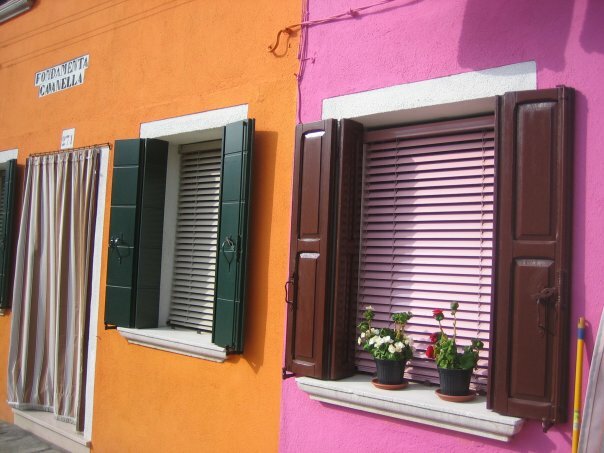 The colours of the houses follow a specific system originating from the golden age of its development; if someone wants to paint their house the home owners must send a request to the government, who will respond by letting them know which certain colours are permitted for that lot. 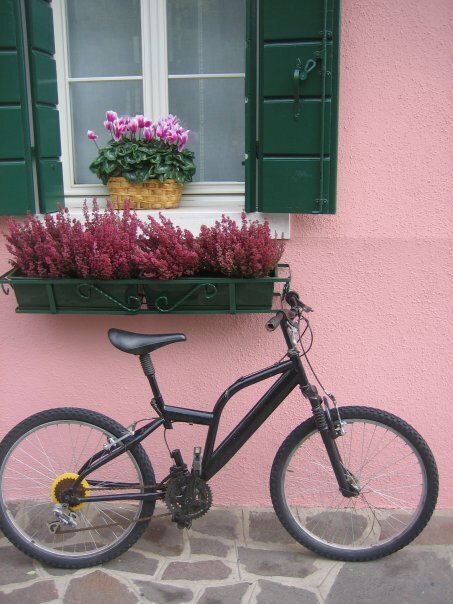 Here’s a couple of bikes I spotted leaning up against houses, I love the weird wheel on one of the bikes – no doubt Neil would love to have a go on it, any sort of wheeled transportation and he is all over it. 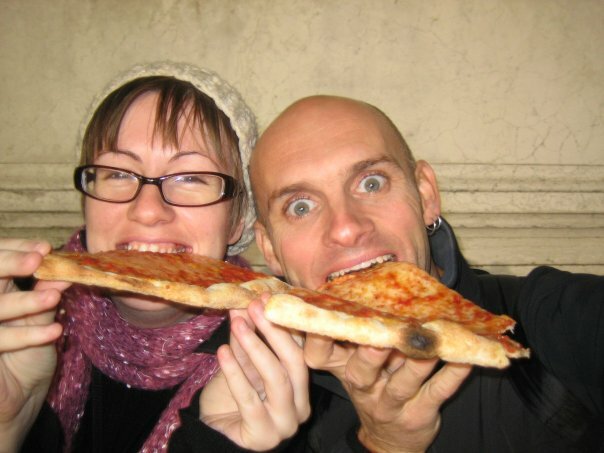 Here we are indulging in one of our favourite Italian past times – pizza pizza pizza!! Back through the whirling mists of time now peeps, back to a fantastic break to Venice, the elaborate, gorgeous, decaying, sinking city of canals, mists and gondolas. We arrived in the dark to find the B and B we had chosen had doubled booked our room and had an alternative for us for one night. 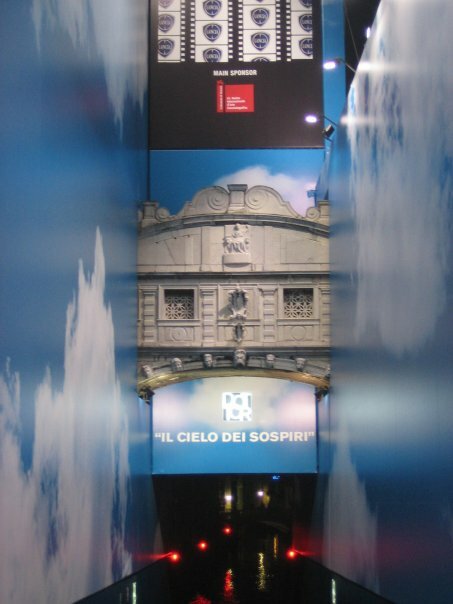 Up and down steps, around back streets, until we arrived at what we termed “The Coffin Room”. 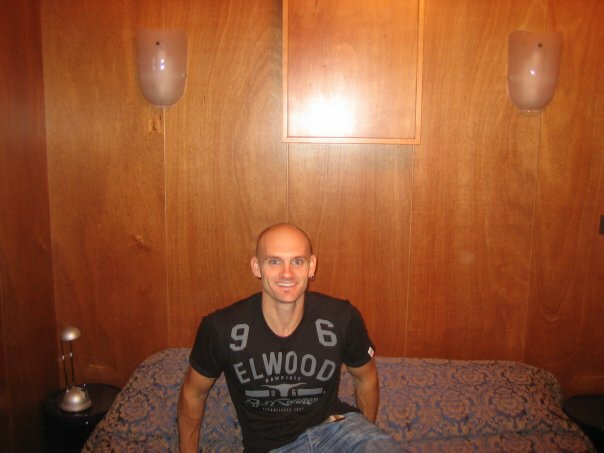 Here’s Neil in the creepy room that was so damp the sheets felt wet!! Not a great start to the Venitian experience it has to be said, but onwards and upwards. The next day we were transfered to our chosen B and B and finally got to see some of the city. 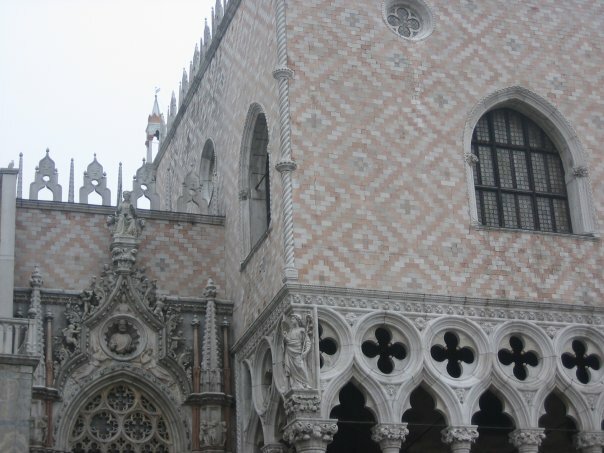 First up obviously was Pizza San Marco (St Marks square), the Basilica, Campanile and the Doges Palace. 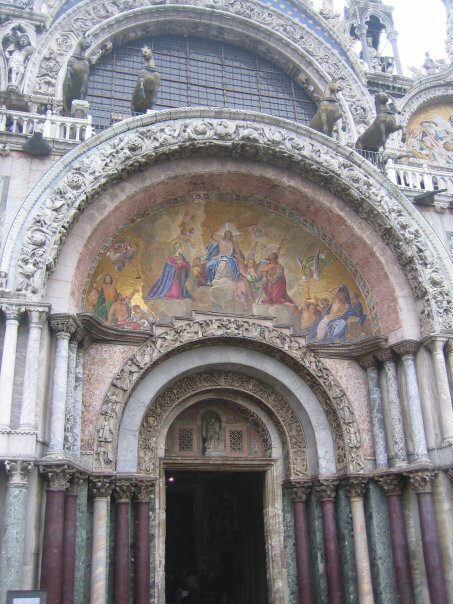 St Mark’s Basilica is highly ornate and the most famous of the city’s churches and one of the best known examples of Byzantine architecture. 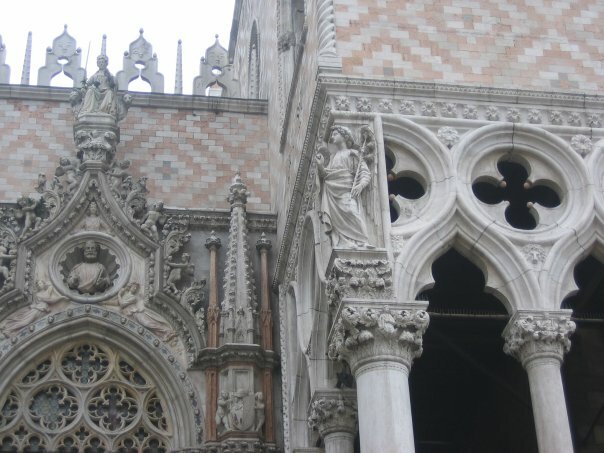 Here’s part of the facade of St Mark’s basilica. It’s a beautiful 19th century gold mosaic of the Last Judgement. 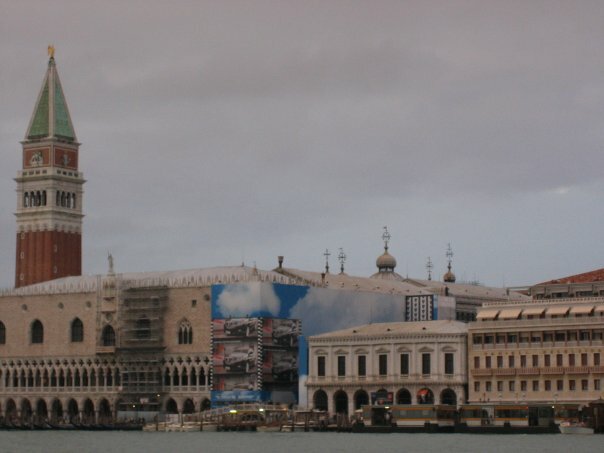 Here you can see the Doges Palace on the right, its beautifully patterned with red and white. 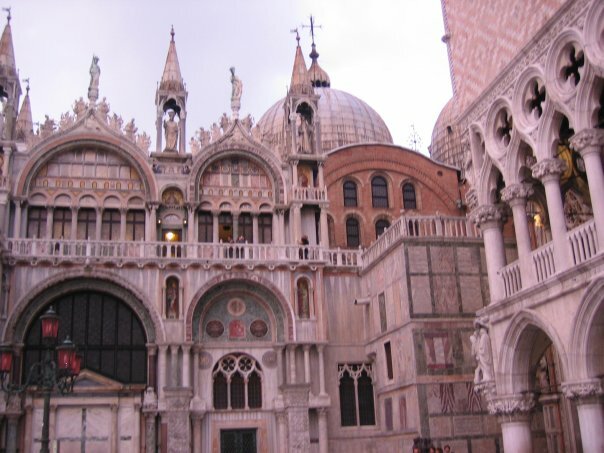 The palace was the residence of the Doge of Venice, the supreme authority of the Republic of Venice. 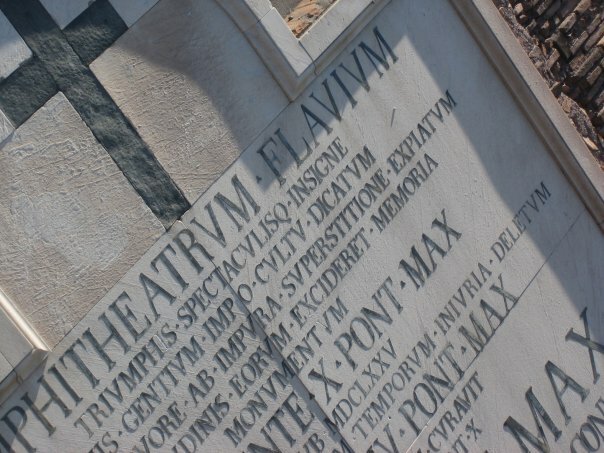 Here is some more detailing from the ornate facade of the Palace. 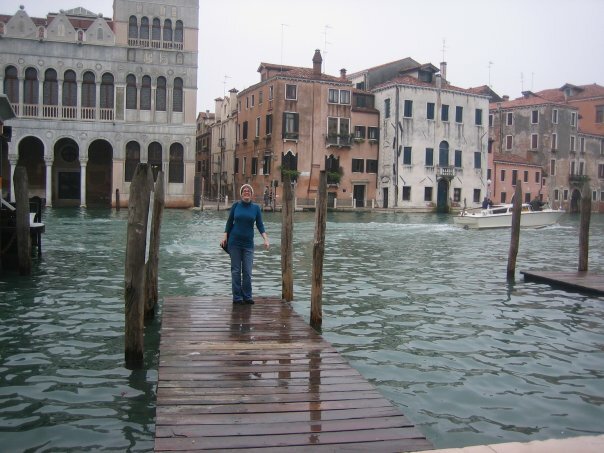 Here I am next to the Grand Canal, the water is lapping my feet!! 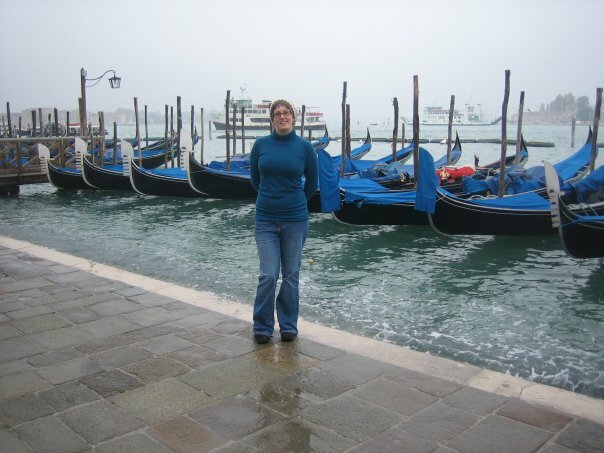 And next to the Gondola’s parking spaces . . . .
Next up we are nipping onto one of the water taxis (vaporetto) that cruise the Grand canal and the rest of the waterways for a zip around the sights. Line 1 plies its trade up and down the Grand Canal, sort of the M1 of Venice, where all sorts of waterbourne crafts zoom around. 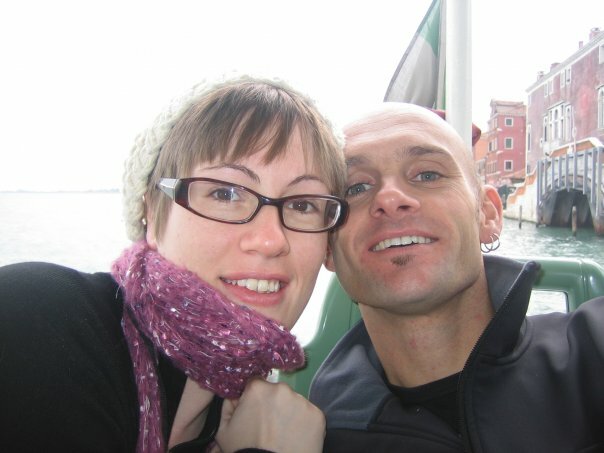 Here we are, gosh we look young!! 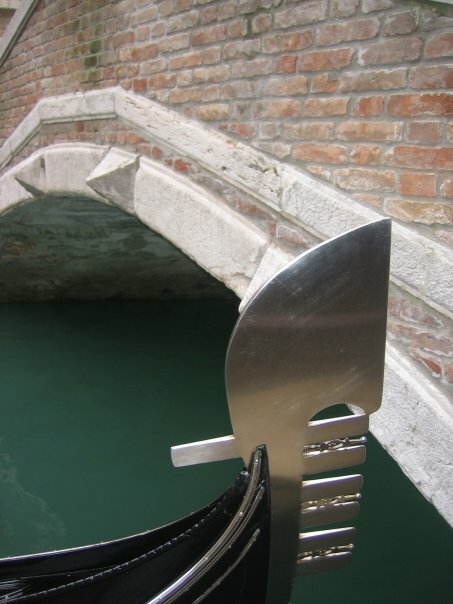 The banks of the Grand Canal are lined with more than 170 buildings, most of which date from the 13th to the 18th century and demonstrate the welfare and art created by the Republic of Venice. Some of the main sights include the Rialto bridge, the Ponte dell’ Accademia and numerous palaces that emerge directly from the water. Here’s some snaps as we cruised past ornate buildings and tiny hidden gardens and later as we criss crossed little bridges and rambled the back streets. Lots of ornate windows to be found. This bizarre thing is advertising where the Bridge of Sighs is being renovated, it’s like a strange car advert / Disneyfied version of it! 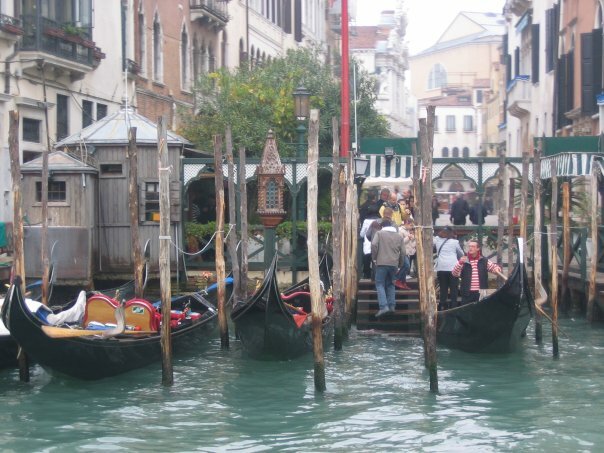 Next up Gondolas and the colourful delights of Murano and Burano. As I ramble on about this and that, I do stop to wonder who, if anyone, actually reads this thing. As it is mainly a trawl through my own holidays it is probably a bit of a self centred, egocentric thing to do, but I do seem to have a few people across the globe who take a gander occasionally. Alas I have no actual followers so I can’t return the favour but I would love to know who you are, out there in cyber space, that take the time to browse the blog from time to time. Drop me a line, write me a comment, I would love to say hello!!! Also if any one has any travel recommendations I would be keen to hear them, always on the look out for more inspiration. I think Japan is high on the to do list, so if anyone has any tips or recommendations for visiting then I would be eager to hear them!!! Ramble again soon . . .